The book consists of the eight chapters found in the original Pāli text complemented by an introduction, footnotes and appendices. All brief grammatical rules called Suttas are shown in both Devanagari and Romanized Pāli along with applicable example words, non-applicable examples, and split-Sutta functions. Detailed meanings and relevant examples regarding the Pali prefixes are also explained. Also included are details of the system of how verbs are formed. To make the study of Pāli more accessible, a brief study-guide is also included in the introduction of the book. A. Thitzana is a Buddhist monk born in Myanmar (Burma), he studied both Pāli and Buddhist texts over a period of more than thirty years. He hails from a strong back ground of learning and teaching. 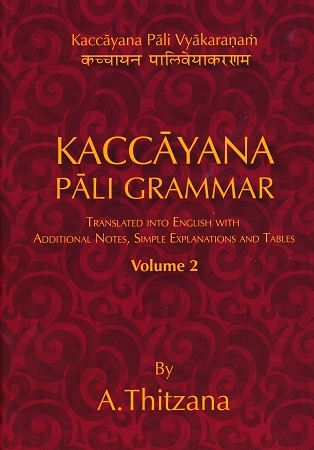 In this book he has skillfully presented the grammar of the ancient Pāli language along with an English translation that is free from the complex nuances of linguistics and grammatical norms inherent in the ancient Indo-Aryan languages of Sanskrit and Pali.